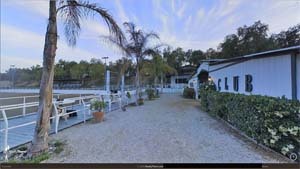 You are here: Home / About Polo / Polo Anyone? Imagine a ball hit so hard that it is coming at you at a speed of 110 miles per hour! The ball is moving so fast you can hardly see it. Your job is to stay at a gallop, get your horse in line with this flash of white and either pass it ahead to a teammate or carry the ball down the field for an attempt at a goal. This is polo as played by some of the greatest athletes in the world. Today the game is played in more than 80 countries and enjoyed by more than 50 million people each year. In countries such as Argentina, Brazil, Australia and Great Britain, championship matches draw crowds rivaling and many times exceeding those at football and basketball games in the United States. Polo is a goal game played on horseback and, in its fundamental principles, one of the most ancient of games. It is thought to be several thousand years old, originating in Persia, and came to the United States via England one hundred and thirty years ago courtesy of James Gordon Bennett, the American publisher and sportsman. Impressed by the games he had seen at the Hurlingham Club in London, on his return to America, Bennett brought along a supply of polo balls and mallets. Texas cow ponies were brought to New York, and that winter, 1876, indoors at Dickel’s Riding Academy, several people learned to hit and ride for polo. The next summer, 1877, they went to Jerome Park Racetrack, north of New York City, and played outdoors. Outdoors, polo is played between four man teams on a polo field 300 yards long and 160 yards wide. There are goals at each end line, spaced eight yards apart. Players carry slender handled mallets and attempt to hit the ball through the goal posts. Each goal counts one point. The outdoor ball, of hard white plastic, is a little over 3” in diameter. The ball is stroked with the side of the head, not the end as in croquet. The game is played in six chukkers (periods) of seven-and-one-half minutes. Played under practically the same rules, arena polo differs from outdoor polo in five major respects: three players instead of four; four chukkers instead of six; smaller enclosed field (110 by 50 yards); playing surface of clay, sand and topsoil; leather-covered inflatable ball instead of a wooden ball. 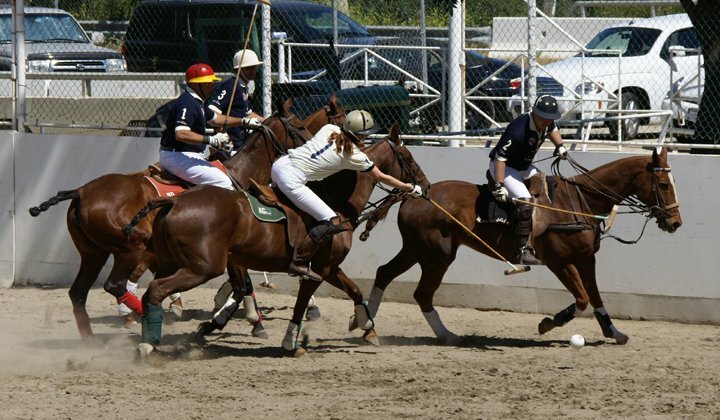 There are rules in a polo game against riders leading their horses into the paths of other players and horses, but collisions are merely one of the game’s hazards. Both the horse and the rider run the risk of losing their balance, falling to the turf, and sometimes breaking bones. However, injuries to ponies and riders are few. The ball, although hard, is too light to inflict much damage; mallets are less stoutly made than appears to be the case, and even a vigorous accidental blow is unlikely to break a bone. For protection, the players wear helmets and knee guards while the horses’ legs are well wrapped to prevent any injuries. All players registered with the United States Polo Association are given a handicap by the association. The handicapping system, in effect a ranking list, is based on a natural estimate of the number of goals a player is worth to his team. His handicap has nothing to do with his expected scoring in a game. It is based on horsemanship, team play, knowledge of the game, hitting ability, game sense and quality of horses. For instance, a handicap of 10-goals, which is the highest ever given, implies a player of the greatest talents and in constant practice. The lowest handicap possible is -2, and is usually carried by the beginning player. A high rating is so difficult to attain that 90% of the US players are rated at 2-goals or below. Although in international competition, thoroughbreds are used, the only criteria for the selection of a polo pony are that it should be both large enough to carry its rider without loss of pace and small enough to be handy. Because the game is very hard on the ponies, no horse plays two successive chukkers, and at the highest level of play, each player rides at least six horses in the course of a six chukker game-many times using twice that number and changing on the fly in the middle of a period. Today there are over 200 active polo clubs and approximately 3,600 members registered with the United States Polo Association. California has the largest population of registered polo players in the country.